The premise: modern-day Metis student William (Aaron M. Wells) moves to Toronto from Winnipeg on a music scholarship for Indigenous students. He immerses himself into the life of Creek/Cherokee singer Tsianina Redfeather (Marion Newman) who performed widely in the 1910s and 20s to audiences who wondered if this “pretty little thing” could speak English. Through her story, William attempts to come to terms with the use of Indigenous music by white artists and how he fits into that picture. Their two stories are deftly intertwined as Tsianina Redfeather and William appear in each other’s realities. Interestingly, Tsianina is like an invisible shadow in William’s apartment, placing her biography in strategic locations so her story won’t get brushed aside; then in the second act, the two of them (or their spirits) converse in the same world. Many parallels exist between Tsianina Redfeather and William: both have music as a lifeline, both have white benefactors, and both struggle with questions of authorship. Both also end their journeys by “going in the forest,” which I believe means that they take steps towards reclaiming their culture. I Call myself Princess also gives a nod to challenges faced by Black people, women and homosexuals. There is an amusing scene in which William is almost jealous of his black boyfriend Alex since he gets thirty days of recognition during Black History Month. Also it’s notable to recognize that Cadman’s lyrics were written by Nelle Richmond Eberhart, who broke ground by becoming the first woman librettist to have her work performed at the New York Metropolitan Opera. Tsianina Redfeather helped her get there. At the start of the play, I thought the operatic music was by Charles Wakefield Cadman; by the end I came to understand that this white composer’s career was built by “borrowing” or “stealing” music from Indigenous peoples, depending on how you look at it. I knew nothing of Indigenous performers before this play, nor was I familiar with the Indianist movement during Tsianina Redfeather’s time. It was surprising to me that American classical music had incorporated Indigenous melodies. I learned so much about untold stories during I Call myself Princess. 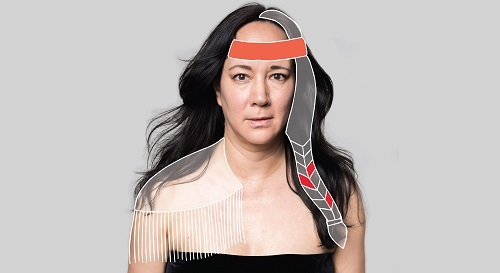 Bravo to Jani Lauzon and her team for reviving Tsianina Redfeather in such a beautiful, genuine manner and for opening our eyes to different versions of musical history. Previous PostCheap Theatre in Toronto for the Week of September 10th, 2018Next PostPlaylistings in Toronto for the week of September 17th, 2018. The first time I read this review I was deeply uncomfortable with how the reviewer talks about Indigenous people and gay/queer people. Having now seen the show, I am more uncomfortable. It feels deeply troubling to send a reviewer who “knew nothing of Indigenous performers before this play” to see a show that is deeply about Indigenous performers, and cultural appropriation. This show deserved a better. The scene described as “amusing” where William and Alex argue about whether Indigenous people or Black people are more maligned in settler society is not amusing – it’s hard hitting. It further opens the door to talk about the failings of settlers, slave owning Indigenous people, and both colonization and anti-blackness. The reviewer writes “gives a nod to challenges faced by Black people, women and homosexuals”. First, the word homosexuals is a deeply medicalized/pathologized one, and one that should not be used. I initially assumed the reviewer was using it because it was used in the play, but no, the uncomfortable and judgemental language is the review’s. The play does not just nod, but centres the experiences of a contemporary Metis man and a light skinned Black man who are lovers, and a historic figure who was a mad who desired men. It powerfully looks at connections and overlaps between racial identities and queerness, and failures in those overlaps. It openly looks at the racism and colonization by a white gay man, who benefited from whiteness while being penalized for his sexuality, and openly addresses how marginalization can make us both aware of others’ marginalization and participants in their marginalization. This show is powerful, moving, and necessary. The language the reviewer chose is language of a colonial, heterosexual culture, and this play is about interrogating that and doing better.